To Cite: Askarinia M, Ghaedi M, Manzouri L, Khoramrooz S S, Sharifi A, et al. The Effect of Cu-BPDCA-Ty on Antibacterial Activity and The Expression of mecA Gene in Clinical and Standard Strains of Methicillin-Resistant Staphylococcus aureus, Jundishapur J Microbiol. 2018 ; 11(3):e60680. doi: 10.5812/jjm.60680. Background: The antibiotic resistance of bacteria has increased in the last decade. The mecA gene plays an important role in the pathogenicity of Methicillin-Resistant Staphylococcus aureus (MRSA) by increasing antibiotics resistance. Recent studies have indicated that nanotechnology, as an antimicrobial agent, has had promising results. Objectives: The present study was conducted to determine the effect of Cu-BPDCA-Ty on antibacterial activity and mecA gene expression in clinical and standard strains of MRSA. Methods: The phenotypic tests were used to identify MRSA strain and confirmed with molecular detection of mecA gene. 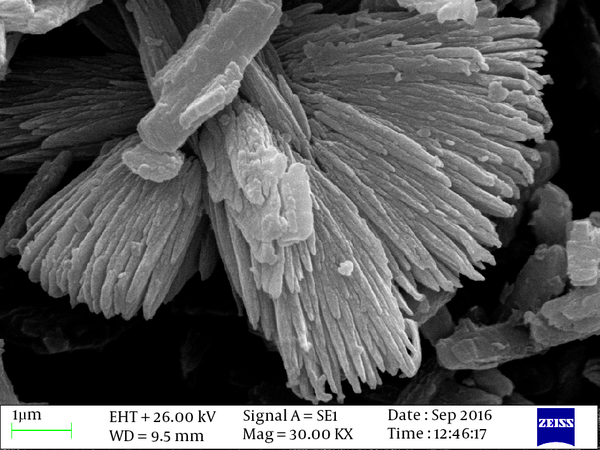 Synthesized Cu-BPDCA-Ty was confirmed with different techniques such as XRD and SEM analysis. The minimum inhibitory concentration (MIC) and the minimum bactericidal concentration (MBC) were determined by the micro broth dilution method. Real time PCR was used to investigate gene expression. Pta gene was considered as an endogenous control for normalization. Data were analyzed using one sample t test and paired t test in the SPSS software Version 22. Results: The findings indicated that the MIC and the MBC of Cu-BPDCA-Ty against the standard and clinical strains of MRSA were 0.5 mg/mL, 0.8 mg/mL, 0.46 ± 0.08 mg/mL, and 0.7 ± 0.1 mg/mL, respectively. Analysis of the real- time PCR indicated that all treated groups with Cu-BPDCA- Ty showed a significant decrease in the expression of the mecA gene compared to the control group (P < 0.05). Conclusions: Cu-BPDCA-Ty had an antibacterial effect on MRSA and induced downregulation of expression of the mecA gene. One of the main agents of infectious diseases is methicillin-resistant Staphylococcus aureus (MRSA) (1). This pathogen causes a series of infections in soft tissues and skin, such as bacteremia, endocarditis, pneumonia, toxic shock syndrome, osteomyelitis, and septicemia (2). Methicillin-resistant S. aureus are bacteria responsible for several difficult-to-treat infections in humans and high rate mortality due to the process of natural selection. These infections are more difficult to treat with common standard antibiotics, so they are a potential risk for the human health (3, 4). These bacteria are the most frequent agents in the community and hospitals. Community-associated methicillin-resistant S. aureus (CA-MRSA) distribution has changed globally (5, 6). Resistance to beta-lactam antibiotics in MRSA is caused by mecA, the gene encoding penicillin-binding protein (PBP2a) with the low affinity to beta-lactams, which was first discovered in 1960 (7). Methicillin-resistant Staphylococcus aureus could be prevented if penicillin-binding proteins are intact (8). The emergence of resistance to MRSA has developed the need for novel strategies to replace alternatives to traditional antibiotics (9). Nanotechnology is gaining much attention in the current century due to its capability to modify properties of metals into their nanoscale (10). Recently, researchers have identified nanotechnology as promising to the antimicrobial agent (11). Antimicrobial mechanisms of nanomaterials include disruption of cell membrane, production of reactive oxygen species, and inhibition of enzyme activity, DNA synthesis, and interruption of energy transduction (12). One of the nanomaterials is metal-organic frameworks (MOFs), which are porous, hybrid materials containing metal ions linked by organic binding ligands. In addition, these nanostructures have demonstrated significant antibacterial activity and their properties make the MOFs promising candidates for medical applications (13). One of the metals used is the nanostructure copper, which is showing antimicrobial features. The major mechanisms of copper are cytoplasmic membrane damage or DNA damage with the production of reactive oxygen species (ROS) (14, 15). Consequently, the synergistic effect between the presence of copper and stable structures has been expected to mainly improve the antibacterial effect. Considering the increase in resistance of antibiotics of MRSA and useful properties of the nanostructure, we designed then synthesized the Cu-BPDCA-Ty nanostructures. The present study aimed at evaluating the antibacterial potential of Cu-BPDCA- Ty and its effect(s) on the expression of mecA gene of MRSA. Bacterial strains were used in MRSA (ATCC 33591, mecA positive), MSSA (ATCC25923, mecA negative), and 5 clinical strains of MRSA. Clinical strains were obtained from the microbiology laboratory of the school of medicine of Yasuj University of Medical Sciences. Conventional biochemical tests such as catalase, tube coagulase, fermentation of manitol salt agar (MSA), and DNase were used to identify clinical strain of S. aureus. Presence of S. aureus isolates were confirmed by amplifying the nucA gene. Cefoxitin containing disk was used for phenotypic identification of MRSA strains, according to the clinical and laboratory standards institute guideline (CLSI) (16). The mecA gene was amplified by PCR method for molecular confirmation of MRSA isolates, as described previously. Also, we tested susceptibility pattern of the isolates against. Primers were used at a concentration of 10 picomoles. The primers used for the detection and the amplification protocol are listed in Tables 1 and 2, respectively. The Cu-BPDCA-Ty was prepared by ultrasound-assisted solvo thermal method as follows: Thymine (0.125 mmol) and biphenyl dicarboxylate acid (0.25 mmol) were mixed for 30 minutes in 100 mL of solvent with a volume ratio (70 DMF: 30 H2O). The ultrasonic bath was used for the mix. Then, nitric acid (1 mmol) was added for 30 minutes under ultrasonic waves. Following copper (II), nitrate (Cu (NO3)2) (0.375 mmol) was added to the solution for 30 minutes. Subsequently, the mixture was transferred into a Teflon lined autoclave, heated at 130°C for 24 hours, and then cooled to room temperature naturally. Finally, the precipitate was washed with H2O and ethanol and dried in an oven at 120°C (19). The minimum inhibitory concentration (MIC) of nanostructure was determined by broth microdilution method using sterile 96-well microplates. Concentrations used ranged from 0.1 to 1 mg/mL. The final volume of the well was 100 μL. The volume required from the culture medium and the nanostructure was calculated using the following formula: C1V1 = C2V2. The serial dilution with sterile Mueller Hinton broth (MHB) was transferred into well of a microplate and inoculated with 5 μL of standardized (4 - 5 × 105 CFU/ mL) bacterial suspension. Moreover, the microplate was incubated aerobically at 37°C for 18 to 24 hours. Subsequently, the lowest concentration of the nanostructure prevented the growth of bacteria as MIC. The positive control contained the bacteria inoculated into MHB, without Cu-BPDCA-Ty, and the negative control was only media, without bacteria and Cu-BPDCA-Ty. Finally, turbidity was measured using a microplate reader (BiotecElx 800) at the wavelength of 630 nm. In addition, the minimum bactericidal concentration (MBC) was performed by subculturing 100 μL/mL of wells without turbidity on the blood agar medium and incubated at 37°C for 24 hours (20). 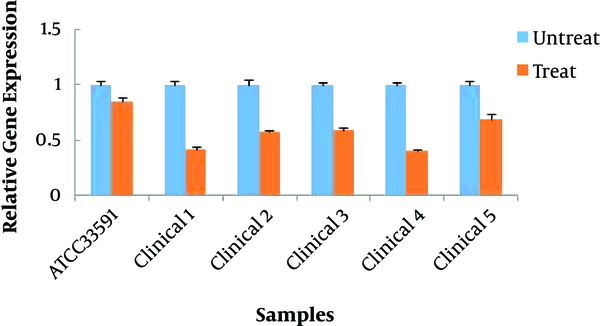 The effect of Cu-BPDCA-Ty on gene expression was determined by a real- time PCR assay. All MRSA isolates were treated with the minimum inhibitory concentration (0.1 - 1 mg/mL) of Cu-BPDCA-Ty and incubated at 37°C for 24 hours. One mL of the bacterial suspension was centrifuged and washed with DEPC-treated water. Then, microtubes were resuspended in 100 μL/mL of TE buffer (10 mmTris-HCL/1 mm EDTA, pH 8) containing 2 mg lysozyme (Sigma-Aldrich Chemie Gmbh, Steinheim, Germany). The RNA extraction was performed according to the manufacturer’s instructions (bio flux, Shibuya-ku, Tokyo, Japan). DNA contamination in the RNA preparation was digested using ‘‘RNase-free DNase I (Thermo scientific). The RNA templates were eluted in 50 μL RNase-free water. The quantity of RNA was assessed using a nanodrop spectrophotometer (Microspectrophotometer, Nano DOT, ND-3800). Purified RNA was used in a 10 μL reverse transcription reaction to synthesize cDNA. The oligo-dT and random hexamer primers were provided in prime script TM RT Reagent Kit (Takara, clontech, Japan), according to the manufacturer’s instructions. Real- time PCR was performed in duplicate using a Real Q plus 2 x Master Mix Green (Ampliqon, Denmark) by the ABI Step one real time pcr system (Applied Biosystems). cDNA was used as a template in 20 μL reactions. The real- time PCR cycling was performed at 95°C for 15 minutes, followed by 38 cycles (95°C for 10 seconds, 60°C for 30 seconds, 72°C for 30 seconds). Finally, a melting stage was determined for the unspecific PCR product or possible primer dimmers. Water (no template) was used as a negative control in all qPCR runs. pta gene (Phosphate acetyltransferase) was used as an endogenous control. The efficiency of amplification determined standard curves based on genomic DNA by real- time PCR. The primers employed in the present study are described in Table 3. The relative expression of the mecA gene was performed using the 2-ΔΔCt method. Data obtained were analyzed using paired t test and one sample t test in SPSS v22 software. In all statistical calculations, P value was considered to be less than 0.05. All the 5 clinical isolates that carried nucA gene were confirmed as S. aureus. In all S. aureus isolates, except for S. aureus ATCC25923, inhibition zone for cefoxitin was < 21 mm and also they carried mecA gene, and were then identified as MRSA strains. Synthesized Cu-BPDCA-Ty was confirmed with different techniques such as XRD and SEM analysis. The SEM (Figure 1) indicated that the compound was a uniform structure of sponge-shaped nanorods. In addition, the thicknesses of nanorods were estimated to be about less than 100 nm, but the length of the nanorods was about 500 nanometers. These data indicated the high ratio of length to width of the compound that showed this structure is appropriate for antibacterial applications (Figure 1). 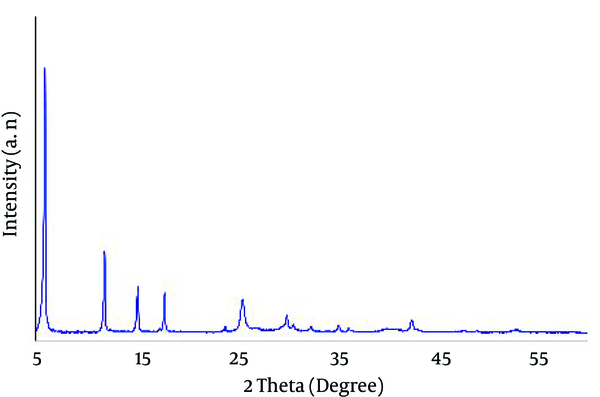 Powder XRD pattern (Figure 2), the combination of Cu-BPDCA-Ty, has indicated the lack of peaks related to copper oxide compounds (Cu2O and CuO). Generally, the detection of the crystalline structure of copper-based MOFs was disturbed by present copper oxide compounds. These data desired the successful synthesis of Cu-BPDCA-Ty. Peaks related to these intruder agents were 35.5, 38.5, 48.9, and 53.3 of CuO, and 36 and 42.5 of Cu2O. In total, MOFs are well represented as organic metal polymers or quaternary anionic polymers, with the presence of sharp and long peaks in the region of 2 Ѳ below 21 in their spectrum of XRD. Minimum inhibitory concentrations and MBCs values were determined for each isolated MRSA. Results showed that the minimal inhibitory concentration required Cu-BPDCA-Ty to inhibit growth standard strain of MRSA, which was 0.5 mg/mL, and the clinical strain of MRSA, which was 0.46 ± 0.08 mg/mL. The minimal bactericidal concentrations were determined to be 0.8 mg/mL for the standard strain of MRSA and 0.7 ± 0.1 mg/mL for clinical strains of MRSA (P > 0.05). Molecular results indicated that all treated groups with Cu-BPDCA- Ty had a significant decrease in the expression of the mecA gene compared to the related control group (P < 0.05) (Figure 3). Methicillin-resistant S. aureus is an important pathogen in hospitals and communities. The emergence of multi-drug resistance of MRSA has challenged the treatment of S. aureus infection. The rapid diagnosis of MRSA is an important step in preventing the spread of infection and reducing mortality. Molecular methods are the most accurate diagnostic methods. Detection of mecA gene is a gold standard test for MRSA, which is due to the simplicity and repeatability of the molecular methods such as PCR (23). In the present study, like other similar studies, MRSA was detected using the molecular method of PCR of mecA gene, which confirms the results of previous researchers (24). The present study revealed that MIC was different in isolated bacteria used. Our results indicated that the level of MIC was higher than other studies such as Azad et al. due to the different compounds used to build the structure of the metal organic frameworks or the greater resistance of the strains in this study (25). Metal/metal oxide nanoparticulate system, such as MOFs, have shown significant antibacterial activity. MOFs as a reservoir for metal ions lead to their gradual release and result in induced antibacterial activity (13). The antibacterial mechanism of this compound is related to the release of Cu2+ ion. These positive ions interact with the negative charge of bacterial lipids, and after destroying the wall and membrane and entering the cell, an enzymatic activity is targeted in the bacterium, which ultimately leads to a reduction in gene expression (26, 27). Raffi et al. and Gunawan et al. attributed antibacterial activity of copper NPs to the released Cu2+ ions in bacteria and induced intracellular reactive oxygen species generation. Eventually, cytolysis of bacteria occurs because of their opposite electrical charges that lead to the release of cellular materials (28, 29). Similar to previous studies (30-33), the present study found that the antibacterial activity of nanostructures includes metal/metal oxide copper. The real- time PCR method is sensitive and commonly used to detect gene expression. The housekeeping genes (HKGs) were used for relative measurements on the change in gene expression relative to real- time PCR investigations. Ideally, the HKGs are as controls. HKG, which was utilized in the present study, was phosphate acetyl transferase (pta) gene. The expressed housekeeping gene is usually quantified at the same time. The pta gene showed good stability in the experimental settings in different conditions, such as temperature, pH, and aeration (21). The results of the present study showed that pta gene is suitable for normalization of the mec A gene expression under the effect of the Cu-BPDCA- Ty. A significant difference existed in the expression of mecA gene between standard and clinical strains after treatment with Cu-BPDCA- Ty at concentrations of MIC. Previous studies have shown similar results, in which inhibited the expression of the resistant mecA gene. Lee et al. explained that hexane and chloroform fractions of Salvia miltiorrhiza Bunge lead to inhibition of expression of resistant genes mecA, mecI, and mecR1 (34). Chovanova et al. stated that the combination of the essential oil from S. sclarea influenced the inhibition expression of the mecA gene (35). The essential oil similar to copper affects cytoplasmic membrane. You et al. postulated that Rhus javanica extract inhibited the genetic expression of virulence factors, such as mecA, sea, agrA, and sarA in MRSA, which may depend on the presence of phenolics in the extract (22). Similar results, indicated that the inhibition of genes expression of mecA, sea, agrA, and sarA in MRSA by Artemisia princeps, described by Choi et al. may depend on organic acids and glycosides as the major components in the A. princeps extract (36). Qiu et al. stated that TiO2 nanoparticle inhibits the growth of Shewanella oneidensis and shows a significant decrease in the expression level of the pspB gene. They declared that gene expression is a tool appropriate for detecting nanoparticles toxicity mechanisms (37). Saghalli et al. stated that ZnO nanoparticle reduced the rate of hemolysis and the hla gene expression of S. aureus. The researchers suggested that further studies use these nanoparticles as antibacterial coating for the artificial instrument to control bacterial infections (38). In summary, the results of the present study illustrated the potential of Cu-BPDCA-Ty as a combination antibacterial against MRSA and also induced the downregulation of expression of mecA gene, which ultimately leads to the decrease of resistance to beta-lactams antibiotics. Therefore, further studies should be conducted to identify action mechanisms and toxicity of active compounds. Nanomaterial is expected to be recognized as a natural source for the development of new antibacterial components. This paper was a report of a database from the MS. thesis of Marzieh Askarinia registered at Yasuj University of Medical Sciences. This work was supported fully by Yasuj University of Medical Sciences, Yasuj, Iran, (grant No.IR.YUMS.REC.1395.76). Authors’ Contribution: All authors listed have contributed sufficiently to the project, and all those who are qualified to be authors are listed in the author byline. Conflicts of Interest: None to declare. Funding/Support: This study was supported financially by Yasuj University of Medical Sciences, Yasuj, Iran. 1. Geofrey A, Abade A, Aboud S. Methicillin-resistant staphylococcus aureus (MRSA) colonization among Intensive Care Unit (ICU) patients and health care workers at Muhimbili national hospital, Dar Es Salaam, Tanzania, 2012. Pan Afr Med J. 2015;21:211. doi: 10.11604/pamj.2015.21.211.4207. [PubMed: 26448806]. 2. Kahanov L, Kim YK, Eberman L, Dannelly K, Kaur H, Ramalinga A. Staphylococcus aureus and community-associated methicillin-resistant Staphylococcus aureus (CA-MRSA) in and around therapeutic whirlpools in college athletic training rooms. J Athl Train. 2015;50(4):432-7. doi: 10.4085/1062-6050-49.3.96. [PubMed: 25710853]. 3. Mocan L, Ilie I, Matea C, Tabaran F, Kalman E, Iancu C, et al. Surface plasmon resonance-induced photoactivation of gold nanoparticles as bactericidal agents against methicillin-resistant Staphylococcus aureus. Int J Nanomedicine. 2014;9:1453-61. doi: 10.2147/IJN.S54950. [PubMed: 24711697]. 4. Abdel Rahim KA, Ali Mohamed AM. Bactericidal and antibiotic synergistic effect of nanosilver against methicillin resistant staphylococcus aureus. Jundishapur J Microbiol. 2015;8(11):25867. doi: 10.5812/jjm.25867. [PubMed: 26862383]. 5. Harastani HH, Tokajian ST. Community associated methicillin resistant staphylococcus aureus clonal complex 80 type IV (CC80 MRSA IV) isolated from the Middle East, a heterogeneous expanding clonal lineage. PLoS One. 2014;9(7):103715. doi: 10.1371/journal.pone.0103715. [PubMed: 25078407]. 6. Kraushaar B, Fetsch A. First description of PVL-positive methicillin-resistant Staphylococcus aureus (MRSA) in wild boar meat. Int J Food Microbiol. 2014;186:68-73. doi: 10.1016/j.ijfoodmicro.2014.06.018. [PubMed: 25016468]. 7. McKinney TK, Sharma VK, Craig WA, Archer GL. Transcription of the gene mediating methicillin resistance in Staphylococcus aureus (mecA) is corepressed but not coinduced by cognate mecA and beta-lactamase regulators. J Bacteriol. 2001;183(23):6862-8. doi: 10.1128/JB.183.23.6862-6868.2001. [PubMed: 11698375]. 8. Santiago C, Pang EL, Lim KH, Loh HS, Ting KN. Inhibition of penicillin-binding protein 2a (PBP2a) in methicillin resistant Staphylococcus aureus (MRSA) by combination of ampicillin and a bioactive fraction from Duabanga grandiflora. BMC Complement Altern Med. 2015;15:178. doi: 10.1186/s12906-015-0699-z. [PubMed: 26060128]. 9. Millenbaugh NJ, Baskin JB, DeSilva MN, Elliott WR, Glickman RD. Photothermal killing of Staphylococcus aureus using antibody-targeted gold nanoparticles. Int J Nanomedicine. 2015;10:1953-60. doi: 10.2147/IJN.S76150. [PubMed: 25834427]. 10. Rai M, Yadav A, Gade A. Silver nanoparticles as a new generation of antimicrobials. Biotechnol Adv. 2009;27(1):76-83. doi: 10.1016/j.biotechadv.2008.09.002. [PubMed: 18854209]. 11. Vimbela GV, Ngo SM, Fraze C, Yang L, Stout DA. Antibacterial properties and toxicity from metallic nanomaterials. Int J Nanomedicine. 2017;12:3941-65. doi: 10.2147/IJN.S134526. [PubMed: 28579779]. 12. Li Q, Mahendra S, Lyon DY, Brunet L, Liga MV, Li D, et al. Antimicrobial nanomaterials for water disinfection and microbial control: potential applications and implications. Water Res. 2008;42(18):4591-602. doi: 10.1016/j.watres.2008.08.015. [PubMed: 18804836]. 13. Wyszogrodzka G, Marszalek B, Gil B, Dorozynski P. Metal-organic frameworks: mechanisms of antibacterial action and potential applications. Drug Discov Today. 2016;21(6):1009-18. doi: 10.1016/j.drudis.2016.04.009. [PubMed: 27091434]. 14. Santo CE, Quaranta D, Grass G. Antimicrobial metallic copper surfaces kill Staphylococcus haemolyticus via membrane damage. Microbiologyopen. 2012;1(1):46-52. doi: 10.1002/mbo3.2. [PubMed: 22950011]. 15. Pramanik A, Laha D, Bhattacharya D, Pramanik P, Karmakar P. A novel study of antibacterial activity of copper iodide nanoparticle mediated by DNA and membrane damage. Colloids Surf B Biointerfaces. 2012;96:50-5. doi: 10.1016/j.colsurfb.2012.03.021. [PubMed: 22521682]. 16. Clinical and Laboratory Standards Institute (CLSI). Performance standards for antimicrobial susceptibility testing, CLSI document M100-S27. 24th ed. Wayne, PA: Clinical and Laboratory Standards Institute, (CLSI); 2017. 17. Zhang K, McClure JA, Elsayed S, Louie T, Conly JM. Novel multiplex PCR assay for characterization and concomitant subtyping of staphylococcal cassette chromosome mec types I to V in methicillin-resistant Staphylococcus aureus. J Clin Microbiol. 2005;43(10):5026-33. doi: 10.1128/JCM.43.10.5026-5033.2005. [PubMed: 16207957]. 18. Sahebekhtiari N, Nochi Z, Eslampour MA, Dabiri H, Bolfion M, Taherikalani M, et al. Characterization of Staphylococcus aureus strains isolated from raw milk of bovine subclinical mastitis in Tehran and Mashhad. Acta Microbiol Immunol Hung. 2011;58(2):113-21. doi: 10.1556/AMicr.58.2011.2.4. [PubMed: 21715281]. 19. Mousavinia SE, Hajati S, Ghaedi M, Dashtian K. Novel nanorose-like Ce(III)-doped and undoped Cu(II)-biphenyl-4,4-dicarboxylic acid (Cu(II)-BPDCA) MOSs as visible light photocatalysts: synthesis, characterization, photodegradation of toxic dyes and optimization. Phys Chem Chem Phys. 2016;18(16):11278-87. doi: 10.1039/c6cp00910g. [PubMed: 27053427]. 20. Moghimi R, Ghaderi L, Rafati H, Aliahmadi A, McClements DJ. Superior antibacterial activity of nanoemulsion of Thymus daenensis essential oil against E. coli. Food Chem. 2016;194:410-5. doi: 10.1016/j.foodchem.2015.07.139. [PubMed: 26471573]. 21. Duquenne M, Fleurot I, Aigle M, Darrigo C, Borezee-Durant E, Derzelle S, et al. Tool for quantification of staphylococcal enterotoxin gene expression in cheese. Appl Environ Microbiol. 2010;76(5):1367-74. doi: 10.1128/AEM.01736-09. [PubMed: 20061456]. 22. You YO, Choi NY, Kang SY, Kim KJ. Antibacterial Activity of Rhus javanica against Methicillin-Resistant Staphylococcus aureus. Evid Based Complement Alternat Med. 2013;2013:549207. doi: 10.1155/2013/549207. [PubMed: 24223060]. 23. Olowe OA, Kukoyi OO, Taiwo SS, Ojurongbe O, Opaleye OO, Bolaji OS, et al. Phenotypic and molecular characteristics of methicillin-resistant Staphylococcus aureus isolates from Ekiti State, Nigeria. Infect Drug Resist. 2013;6:87-92. doi: 10.2147/IDR.S48809. [PubMed: 23990730]. 24. Thangave A, Rajamanickam C, Sahu O, Ponnappan S, Abawa G, Tadele A. Molecular detection of mecA gene from methicillin resistant coagulase negative staphylococci. J Microbiol Biotechnol. 2017;7(2):11. doi: 10.24896/jmbr.2017723. 25. Azad FN, Ghaedi M, Dashtian K, Hajati S, Pezeshkpour V. Ultrasonically assisted hydrothermal synthesis of activated carbon-HKUST-1-MOF hybrid for efficient simultaneous ultrasound-assisted removal of ternary organic dyes and antibacterial investigation: Taguchi optimization. Ultrason Sonochem. 2016;31:383-93. doi: 10.1016/j.ultsonch.2016.01.024. [PubMed: 26964963]. 26. Zhuang W, Yuan D, Li JR, Luo Z, Zhou HC, Bashir S, et al. Highly potent bactericidal activity of porous metal-organic frameworks. Adv Healthc Mater. 2012;1(2):225-38. doi: 10.1002/adhm.201100043. [PubMed: 23184726]. 27. Pelgrift RY, Friedman AJ. Nanotechnology as a therapeutic tool to combat microbial resistance. Adv Drug Deliv Rev. 2013;65(13-14):1803-15. doi: 10.1016/j.addr.2013.07.011. [PubMed: 23892192]. 28. Raffi M, Mehrwan S, Bhatti TM, Akhter JI, Hameed A, Yawar W, et al. Investigations into the antibacterial behavior of copper nanoparticles against Escherichia coli. Ann Microbiol. 2010;60(1):75-80. doi: 10.1007/s13213-010-0015-6. 29. Gunawan C, Teoh WY, Marquis CP, Amal R. Cytotoxic origin of copper(II) oxide nanoparticles: comparative studies with micron-sized particles, leachate, and metal salts. ACS Nano. 2011;5(9):7214-25. doi: 10.1021/nn2020248. [PubMed: 21812479]. 30. Rodriguez HS, Hinestroza JP, Ochoa Puentes C, Sierra CA, Soto CY. Antibacterial activity against Escherichia coliof Cu BTC, (MOF-199) metal organic framework immobilized onto cellulosic fibers. J Appl Polym Sci. 2014;131(19). doi: 10.1002/app.40815. 31. Sancet MP, Hanke M, Wang Z, Bauer S, Azucena C, Arslan HK, et al. Surface anchored metal-organic frameworks as stimulus responsive antifouling coatings. Biointerphases. 2013;8(1):29. doi: 10.1186/1559-4106-8-29. [PubMed: 24706148]. 32. Azam A, Ahmed AS, Oves M, Khan MS, Memic A. Size-dependent antimicrobial properties of CuO nanoparticles against Gram-positive and -negative bacterial strains. Int J Nanomedicine. 2012;7:3527-35. doi: 10.2147/IJN.S29020. [PubMed: 22848176]. 33. Abbasi AR, Akhbari K, Morsali A. Dense coating of surface mounted CuBTC Metal-Organic Framework nanostructures on silk fibers, prepared by layer-by-layer method under ultrasound irradiation with antibacterial activity. Ultrason Sonochem. 2012;19(4):846-52. doi: 10.1016/j.ultsonch.2011.11.016. [PubMed: 22204978]. 34. Lee JW, Ji YJ, Lee SO, Lee IS. Effect of Saliva miltiorrhiza bunge on antimicrobial activity and resistant gene regulation against methicillin-resistant Staphylococcus aureus (MRSA). J Microbiol. 2007;45(4):350-7. [PubMed: 17846590]. 35. Chovanova R, Mikulasova M, Vaverkova S. Modulation of mecA Gene Expression by Essential Oil from Salvia sclarea and Synergism with Oxacillin in Methicillin Resistant Staphylococcus epidermidis Carrying Different Types of Staphylococcal Chromosomal Cassette mec. Int J Microbiol. 2016;2016:6475837. doi: 10.1155/2016/6475837. [PubMed: 26880926]. 36. Choi NY, Kang SY, Kim KJ. Artemisia princeps Inhibits Biofilm Formation and Virulence-Factor Expression of Antibiotic-Resistant Bacteria. Biomed Res Int. 2015;2015:239519. doi: 10.1155/2015/239519. [PubMed: 26247012]. 37. Qiu TA, Meyer BM, Christenson KG, Klaper RD, Haynes CL. A mechanistic study of TiO2 nanoparticle toxicity on Shewanella oneidensis MR-1 with UV containing simulated solar irradiation, Bacterial growth, riboflavin secretion, and gene expression. Chemosphere. 2017;168:1158-68. doi: 10.1016/j.chemosphere.2016.10.085. [PubMed: 27823777]. 38. Saghalli M, Bidoki SK, Jamali A, Bagheri H, Ghaemi EA. Sub minimum inhibitory concentrations of Zinc Oxide nanoparticles reduce the expression of the staphylococcus aureus Alpha-Hemolysin. Indian J Pharm Sci. 2016;78(6):763-8. doi: 10.4172/pharmaceutical-sciences.1000181.